Tuscany is a region of excellence in the field of food and wine. This land produces highly appreciated wines and the Tuscan cuisine distinguishes itself for its tasty dishes made with genuine natural ingredients turning the simplest dishes into true delicacies to savoured and enjoyed. In Tuscany we offer several fascinating wine tours in visiting some of the most fascinating places, regions and wineries. Learn about the finest Tuscan wines, while visiting the enchanting Tuscan towns of Bolgheri and Castagneto Carducci with its famous cypress alley. Indulge in exquisite Italian wines while visiting classy „enotecas“ (wineries) like the Tenuta dell‘ Ornellaia in Bolgheri. Get together with outstanding winemakers and learn about the art of wine pressing. Enjoy finest Italian wines like Brunello di Montalcino or Nobile di Montepulciano. A full day excursion to the heart of the Chianti Classico area. 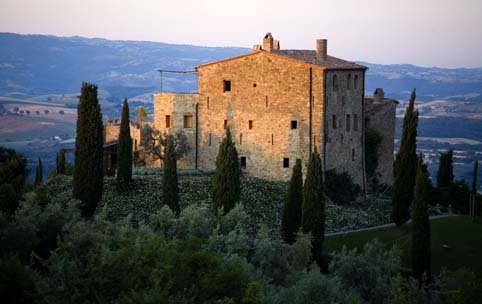 We will visit the beautiful hills of Chianti area, visit 2 wineries highly rated by influential wine publications. You will taste the wines of the winery which will typically include at least one Chianti Classico, a Riserva and an IGT Super Tuscan. For lovers of white wine, on this tour we will also discover the famous white Vernaccia di San Gimignano. Visit of the beautiful town of Montepulciano & the Montepulciano area, birthplace of the well-known Nobile di Montepulciano an aged red wine of high quality. The tour will take you into two small wineries to learn and see the secret of wine making of this special bland. For lunch we will stop in the near town of Montepulciano where you could taste a typical Tuscan lunch. Wine tour to Bolgheri – birthplace of famous Sassicaia – in the west of Tuscany. Here you will taste the famous Tuscan blend of Supertuscan wine. Visiting two wineries & the small towns of Bolgheri and Castagneto Carducci. Winemakers in the Bolgheri zone specialize in red Tuscany wine created by blending the grapes of Cabernet Franc, Sangiovese, Syrah, Merlot or Cabernet Sauvignon. Several different wines are produced using different combinations of these grapes.